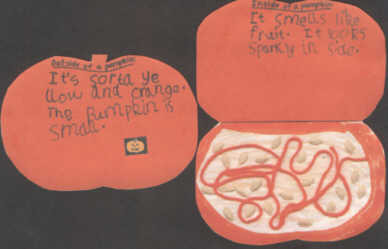 Encourage children to talk about what they know about pumpkins: What do you think it would look like inside? Have you ever carved a pumpkin? etc. 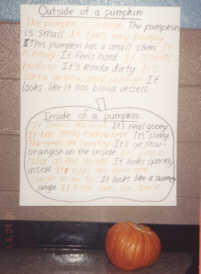 Encourage children to use their senses to describe the outside of the pumpkin & record their reponses on the chart. What does it feel like, smell like, look like, sound like, etc.? Then, remove the pumpkin’s lid and have the children observe & describe the inside of the pumpkin. Give them the materials to make a pumpkin book. It only needs to have a cover and 1 page. Have the children record the descriptions of the outside of the pumpkin on the cover. Have them record descriptions for the inside of the pumpkin on the inside cover. On the white inside page, they may paste pumpkin seeds and yarn, and illustrate the inside of the pumpkin using crayons, construction paper, markers, etc. Have the students share their books with friends or the class.